Resident Evil is in a weird place. After the middling Resident Evil 6 and the public flogging of Operation Raccoon City, I'm sure Capcom got the message that it needed to go back to basics. It did just that with Revelations on the Nintendo 3DS, which was met with enough positivity to warrant a full-on set of console ports. 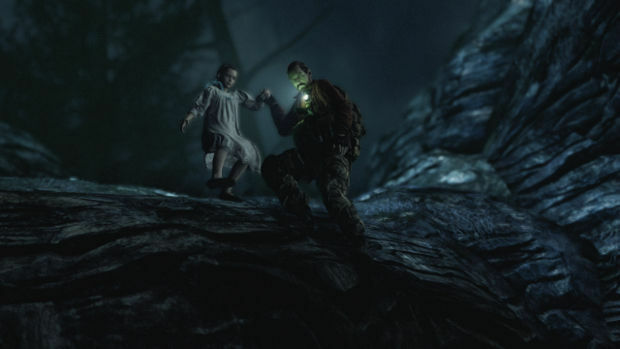 Then Capcom reached overwhelming amounts of success with Resident Evil HD, a game that's as basic as you get in terms of fundamental survivor horror. Resident Evil: Revelations 2 may be more action-oriented than some other entries, but it's a damn fine showing for the series. Revelations 2 is being presented in a peculiar way. Instead of using the traditional retail model, Capcom is opting to release the game episodically, with one chapter each week and a chunk of Raid Mode missions. You can buy individual episodes for $6 a piece, spring for the $25 Season Pass, or buy the disc-based version for $40, which comes with a few extras (though, eventually, said extras will be on sale via DLC). Weird distribution aside, Revelations 2 is worth paying money for at any level. The core story sees series regular Claire Redfield in the line of fire once again, this time paired with Barry Burton's daughter, Moira. 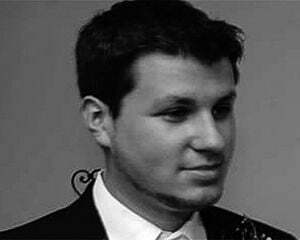 After an ambush at a benefit involving their employer, the pair are whisked away to a dungeon-like setting with no real memory of how they got there, or where they are. Around their wrists are bracelets that change color based on a person's fear level, which are seemingly part of some human-testing initiative. It's here you'll encounter the newly minted Afflicted, the main enemy of Revelations 2. 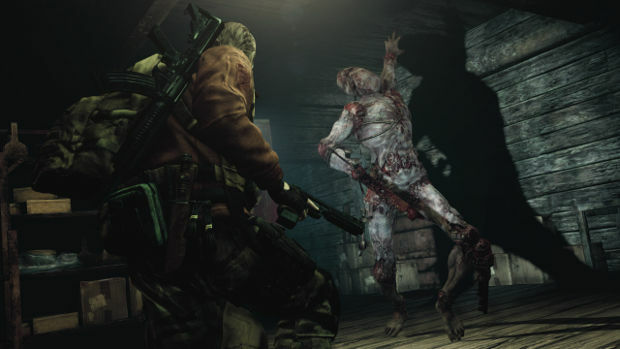 Like past games they're similar to the more flighty undead seen from Resident Evil 5 on, but there are plenty of slow-moving zombies of old and unique denizens to outwit. Claire and Moira will move and operate as a team which, yes, means that co-op or forced AI partnership is in. Don't worry though, because Capcom has made some compromises to how the system works. Instead of two powerhouses running around with a mini-arsenal blowing up zombies at will, Claire is the brawn, and Moira functions as a support class of sorts. 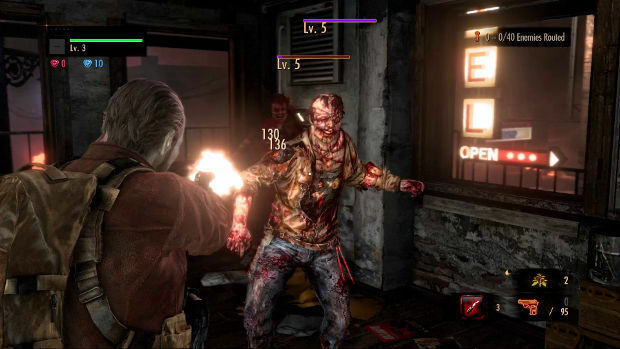 While Claire wields the knife and pistol combo early on into the story, Moira can blind enemies with her flashlight and beat zombies down with a crowbar. This system is framed in such a way that Moira "hates guns" due to an incident in her past, and for the most part works. AI is competent enough where it doesn't constantly screw you, and isn't so powerful that it cuts the tension. Plus, you can change between characters if you want. Local co-op is where it's at, especially if you have a dynamic where the first player taking the mantle is a Resident Evil veteran, and the second is a newcomer to the series. Moira can shine her light to highlight certain areas, which is great for co-op play, as well as locate and identify extra items for Claire. Moira also isn't a pushover, as her blinding power and crowbar are fun to use and work well in tandem with another player. The other pair is Barry and Natalia, who serve as the second act of the first episode, taking place at an undetermined time after the first duo's adventure. While Barry is just as badass as he was in his STARS days, Natalia is a little girl who can't directly attack enemies unless she finds a brick in the environment. There is a catch that makes her a bit more interesting than Moira -- she can "sense" enemies and traps through walls (represented with a mist of sorts) -- and point at locations or weakpoints to make them visible on Barry's screen. It sounds like a passive mechanic, but it's really fun to see it in action as it can get fairly tactical. In one area a small army of enemies piled through a barrier, and my co-op partner quickly identified each enemy to assist in my attack while I made sure to protect her from harm. It's a unique way of doing things as long as the second player is ok with the role. 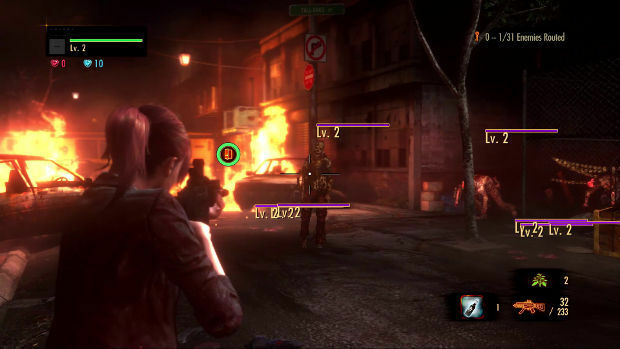 Control-wise, Revelations 2 also uses the "new" action style of play, which allows for full movement control and dodging. If you're feeling a little nostalgic you can opt for a handful of other control schemes, including one that mirrors Resident Evil 4 -- nice touch, Capcom. To top it all off there's an experience system kept up between episodes, which lets you customize your skill set slightly by way of a skill tree. In terms of the story, while the dialog is just as "B-movie" as the rest of the franchise (Moira's swear-heavy millennial dialog is groan worthy), the Saw-like premise is interesting enough to keep you entertained throughout. The identity of your captor is always on your mind, as is the function of Claire and Moira's bracelets, and the origin of Natalia's powers. It's a shame that Alyson Court wasn't asked to return to voice Claire. Whether it's the brevity of each episode or other details like Court's absence, you can't shake the feeling at times that it doesn't quite feel like a full game. Having said that, I appreciate other improvements like the attempt to tie in Revelations 2 with the rest of the series (but not so much so that newcomers will be lost), which the original Revelations didn't really do. There is retreading involved between the two stories, but it's minimal and mostly justified. Of course, there's a cliffhanger to keep you on edge for the next episode. One of my favorite bits is the setting, which should make classic fans happy. Although the Queen Zenobia from the first game was a cool enough area with its endless supply of dark hallways, I wasn't digging the snowy tundras or the swanky office buildings later in the story. The atmosphere in Revelations 2 is well done, from the creepy bloody dungeons to the dark forests that dot the island. The eerie outdoor scenes really remind of Resident Evil 4, which is a good thing. Raid Mode returns, but it's completely new, and dare I say, superior to any past incarnation. This time around there's a cool new setup similar to BioShock 2's multiplayer, with a miniature story integrated into the experience. As part of the Red Queen Alpha simulator, you'll slowly unlock more audio bits as time goes on, giving you some background as to why you're doing what you do. For the uninitiated, Raid Mode is basically a modified version of Mercenaries. Instead of taking on a giant endless playground of foes for a top score, you'll engage in mission-based combat with various parameters as you acquire new weapons, gear, abilities, and characters. If you're a fan of Mercs, Revelations 2 may have the most fully-fledged mode yet, even if you're just picking up the first episode. Missions range from locations that appear in the current game to past entries (mostly RE6 in Episode 1), and task you with killing enemies, protecting objectives, or making it through a miniature campaign mission alive. Some levels are structured as actual stages with a start and end point, some are playgrounds to slaughter enemies until the exit appears. Since the rewards come fast and often, it's addicting to just play "one more stage" to try and reap the rewards and experience, unlocking completely new tactics and powers. Abilities range from active to passive, such as Molotov cocktails and the power to heal yourself more often. Your primary objective beyond leveling is to get "Medallions" -- the maximum of which are awarded if you don't use healing items and kill every enemy in the mission. While you can shamble through some of the earlier levels, you'll need to gather some Medallions eventually to unlock the later stages, or the Hard and Very Hard modes -- where Merc veterans will thrive. To say I was surprised by the new Raid Mode is an understatement, as I would pay full price just to play it. Plus, you can make Barry do the robot or dance like he's in a hip hop video. GOTY? There are 54 Raid Mode missions in the first pack, and over 200 when all is said and done with the final episode. There are secret characters to unlock for Raid, costumes, and the campaign features extra time attack and invisible enemy modes. There are 89 unlockables in all, which is hefty considering the price. Expect reviews for subsequent episodes each week.